On my T1350, on the front window, if you look at the very bottom, outside corners on each side I see a hole in the outside frame (not on the actual window) They could be construed as drain holes (for condensation?) but I'm not sure. The hole is about the size on a pin-head, maybe a tad bigger but not by much. I guess the fear would be if the front awning was open over night and we encountered a driving rain would the rain migrate inwards. Or, worse if we drove down the highway (obvious with the awning closed) could rain water work its way in? The holes cannot be seen from outside the trailer, but when sitting that the table and you look into the window a certain way I see both these holes. Again that's a daylight looking out versus darker looking in. I don't want to seal them if they're suppose to be left open. I don't see these holes on the other windows, which leaves me guessing. BTW all my windows are sealed properly where frame meets the body with proper putty.. I'm doing an inch-by-inch inspection of the entire trailer and this is one of those little inches. Ours has the drain slots as well. Just more pronounced that what you are describing. See this pic, it is just after I installed an upgraded window and have not yet trimmed the sealing tape. There 2 sets of approx qty 2, 1/8" slots on each end of the lower frame. If water or condensation gets inside the metal frame it has a way to get out. They are actually out side the glass area in the lower frame on ours. When the window is fully closed, there is no air loose. Our single hung windows are the same. 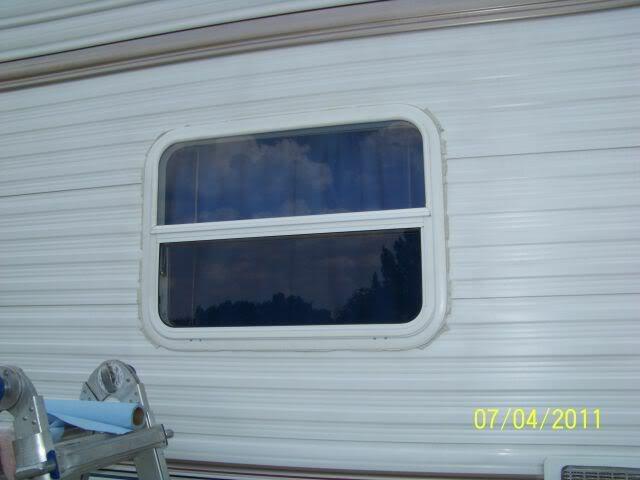 And the sliding windows in our slide unit.